We’ve all been there: you arrive at a door and it won’t open. You turn the knob again and again to no avail. You look for a rock to break the window, and we all know – there either isn’t one or you’re covered in your own blood by the time you get into the house. What if I told you you could leave those days behind? It turns out that most of those doors that don’t open are “locked.” “Locking” is a way to make it so that things won’t open and only a person that has a rock can get in. After a recent arrest and trip to the ER for stitches, a friend of mine suggested I use my keys to get into my car and house. She told me she uses her keys to unlock the things that she owns and it works for her every time. I was skeptical at first. Just like everyone else, I get so used to the way things are and I’m suspicious of promises that a new product will make life so much easier. For every sliced bread there’s a sliced piano – useless and not worth my time. 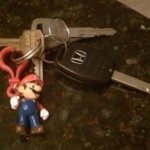 But, let me tell you – my keys are the real deal. They come in all shapes and sizes. You need to have a key for each specific lock. If you don’t have a key for something you want to get into (you don’t own the thing that’s locked, or you forgot your keys, for example), you will still need a rock or crowbar. You can get fun accessories like the one I have. I’m told he’s a little Italian plumber. I think he’s like the patron saint of keys because plumbers are like keys because when your drains are clogged (door), the plumber (key), clears it out (opening the locked door). If you want more of a key you already have, you can take it to a local hardware store and the black magic wizard they have staffed there will sacrifice a goat and conjure another one for you (I think that’s how it happened, I was busy browsing something called “paint” that you can put on your walls and make them a different color). The “lock” is a kind of long, thin hole. You take the key and hold the thicker upper part and then stick the skinnier part in the hole. Then, and here’s the important part – you need to turn the key so that the lock becomes “unlocked.” That then allows you to open the thing you just used the key on. Fun tip: after you’re inside your house, you can use that same key (I know – SO convenient!) to then lock the door behind you so that it makes it harder for people to enter your home and murder you. I know I’m just discovering all the things keys can do, but overall I have to say – they are definitely worth it. They have saved me time, money, and blood. I can’t recommend them more enthusiastically. I was not paid for this endorsement. I strongly believe in the product and have written this review without compensation. Wow. I had no idea. I’m a bit perplexed by some of the things you described but I will have to do some research of my own on these “keys.” Do you have to have doors to have keys? Does the colour of the key make a difference? These will definitely make life easier than carrying around a 10lb sledge hammer like I have been doing. I’m new to all of this as well. I think locks are not only on doors. Mysteries and hearts often need to be unlocked. it’s generally helpful to NOT lock your keys in the car .. especially while it is running… with the headlights on. I would like to see more Cannibalistic Nerd product reviews, please. You need to monetize this damn blog. I’ve wished on a birthday cake that every time I hit publish, hundred dollar bills fall from the sky. I don’t know what the hold up is. So wait…….would these “key” things work on cars as well, or should I just keep using rocks on the windows and tying those little wires together? I use the key to open the car door, then tie the wires together to start it. One day technology will catch up. What? You weren’t paid for this endorsement?? You are doing the internet wrong. If you can unlock (pun!) the secret to this whole key thing, you dern sure ought to make a buck from it. This is still America indn’t it?? I just really believe in the product. But you better believe I’ll be demanding some money for my review on stairs. I’m all about saving blood. And money. But I think I’ll wait until there is some kind of special offer where a second set of keys is thrown in for FREE! and I only have 30 seconds to call before the offer expires and the company will no longer accept my money. You must really love goats. We once had to get a very tall ladder and crawl in through the second floor bedroom, during which time I knocked over a lamp and broke a bulb all over the floor… there was blood. I feel your pain. And the old neighbors thought we were thieves. Our cat once locked us out of our house and we were in our pajamas because we are smart, capable people. Meh. Keys, they’re just a fad. You may be right. In 20 years I’ll look at pictures of myself holding my keys and laugh. 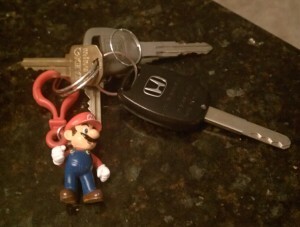 I covet your Italian plumber keychain. It was a Christmas gift. I love him. Sure they sound convenient, but I just can’t justify the cost when I don’t even have a front door. Even if you did have a front door, you’ll need to have it unlocked and open for any orphans who wander by. Well…as long as they’re killing a goat and not a cute animal. Is that a guarantee? I really should have asked more questions about it. Venus! Good to “see” you again!